2011 Tour of Oak Creek taking place October 15th! Good morning fellow bloggers! 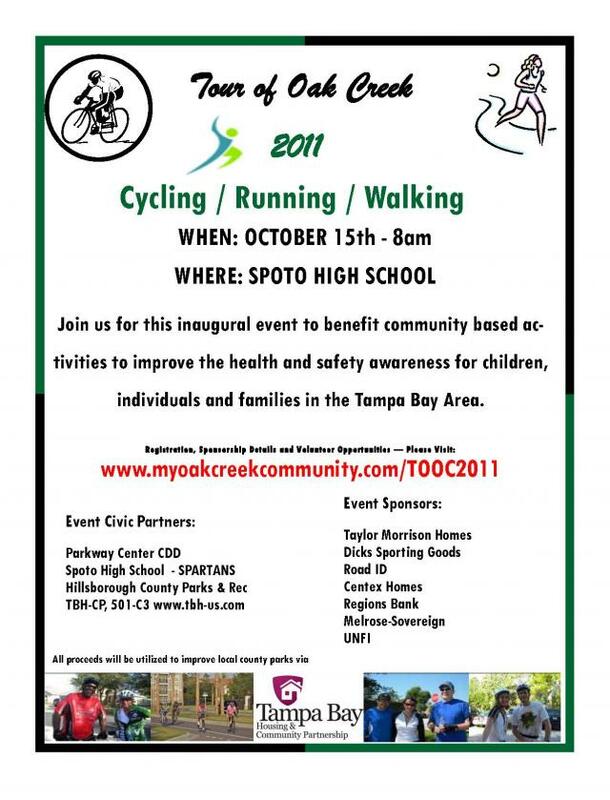 The Inaugural Tour of Oak Creek will be taking place October 15th at Spoto High School. Join in on the effort to benefit community based activities to improve the health and safety awareness for children, individuals and families in the Tampa Bay Area! This two part charity event consists of a 7.5 mile cycling track followed by a 2 mile runnin/walking course. It takes place in Riverview and begins at Spoto High School at 8:00am. The tour’s goal is to establish a sustainable community outreach program, increase social interaction in the Riverview area, promote Oak Creek as a close-knit, caring community open to commercial and residential development, and to partner with local charities and community organizations in the Tampa Bay area through a positive, healthy, community event. That&apos;s all for now, but stay tuned in for more updates on Tampa Bay Sports!